Trump is back from his first trip as president but the harm he did on that trip has not ceased. Indeed it has increased with the recent decision to leave the Paris climate change accord. The reverberations from Europe and the Middle East continue. There is no place that he set font on tht did not create for security, unity ans stability of the global commons and our nations position in the world. Now it is far worse by Trump’s ignoring the great danger to the world which almost all nations recognize and followed the leadership of President Obama and many other nations. America has been diminished greatly by Trump’s incredible actions. The recent dishonourable global travels of Donald Trump have resulted in more disgrace for America. The subtle and sometimes not so subtle rejection of Trump’s vision of a world enhanced by chaos through Trump’s often embrace of the worst behavior of dictatorships and brutal people of the world is but one example that has striped America of its credibility and respect. This after revelations of more evidence that there could be evidence of collusion between the Trump associates and Russian agents, reports of efforts by him to sabotage the federal investigation of himself and his gang of incompetents. We see his continued lying and display of madness. We have him cutting American diplomacy and assistance budgets some 30% which belie anyone who thinks he takes our global challenges seriously. No interlocutors on this trip and his action on global warming can take what he says with believability and act on them and expect support. His first stop in Saudi Arabia was a demonstration of the power of the mutual connivance between two forces of disruption, authoritarian rule and brutality. Not since the infamous Hitler-Stalin Pact before WW II have we rarely seen such discredited leaders see their mutual interest in support of killing others, in ignoring discrimination against woman, and disparaging of democracy. On the part of Trump we saw acceptance of national Saudi leaders who’s funding and actions have help to fuel the spread of the extremist Islamist Wahhabi Salafist ideology that Trump once so vied against. Yes, we can call that hypocrisy. While accepting the lavish opulence and honors of this dictatorial regime behind the brutal murder of thousands of civilians in Yemen via mostly in-discriminative bombing, which is against the law of war and humanitarian norms, Trump signed a $460 billion, ten year arms deal with Saudi Arabia. This will mean even more bombing, more conflict. It will help lead a mad arms race against Saudi Arabia’s main nemesis Iran. This will do nothing to assist a conciliation of the two main lines of Islam Sunni and Shia. This brutal theocracy oppresses its people and has spent billions of dollars exporting their extreme Wahhabi Islamic ideology around the world—the very same ideology fueling terror groups like ISIS and al-Qaeda. His efforts to make worse the Sunni-Shia divide is putting America into a dark caldron of taking sides in Middle East religious conflict. His actions only support the concept that his aim is to create total chaos and keep the world off balance and demoralized. The visit to Israel and the Palestinian Authority was with the stated aim of bring the two together but it was clear that Trump was far more on the side of Israel but he recognized if he could create some agreement between the two sides it would be a “big win” for him but he does not have a clue of the key issues and does not seem to want to learn in any depth on this complex problem. In fact he walked away without a truly any specific breakthroughs. The NATO Brussels visit was a total disaster and Trump talks and behavior was seen as causing much hurt to the alliance, which clearly frightened or allies and was criticized throughout European media. Not least is Trump’s decision not to mention NATO’s Article 5 of supporting a member country under attack. His nasty hectoring our allies on financial support for “NATO” was likely counter productive in the long run. The result was growing distrust of Trump thus of American commitment. One of the great historic blunders in the face of the Russian active efforts to undermine democracy and divide the Atlantic community. His visit to see the Pope was almost surreal with Francis asking Trump, the instigator of actions and views antithetical to Christian beliefs let alone those of the Catholic church especially on dealing with the calamitous impact on all humanity of coming climate change. Nor was there any sign that Trump would respond to any peas for humanitarian actions to assist refugees. The meeting in Sicily of the G-7 of the most powerful nations which include heads of state or Government of Canada, France, Germany, Italy, Japan, and the United Kingdom and the Presidents of the European Council and of the European Commission who on their own without the United State reaffirmed their strong commitment to swiftly implement the Paris Agreement, “as previously stated at the Ise-Shima Summit.” This division was largely a first for the group and a sign of the disunity that will likely ensue. It was here that the disunity of the world community was most glaringly shown due to Trump rejection of action on climate change. The sum of Trump’s action is that he has made America diminished and in greater danger from the external forces at work and made our adversaries more powerful and certainly Putin acts like he has a ”puppet” that has helped him achieve all he could not do on his own to advance Russian agenda to destroy the unity of the West. We welcome you comments! See below comments section. Given its overriding importance as a major overview of the Middle East peace issue from our most experienced and highest diplomat this speech deserves a full reading especially to those that only read the extreme and incorrect criticism of this decision. We all need to read the very balanced and full elements of our policy including the fact that the strongest military help to Israeli was under Obama of any administration. Kerry has also indicated how the right-wing Likud government has undermined a true peace that is fair to all sides by its illegal Israeli massive accelerated building of settlements especially since 2012 and now with some 400,000 settlers on the Palestinian land of the West Bank and East Jerusalem. Already the explosive statements from Netanyahu seem to be another defense of the defenseless given effort to destroy the two state solution and to unilaterally take over the entire West bank. I agree with Kerry that the settlement are incompatible with peace in the region and security of both Israeli and Palestine. It means, in my view, continued instability and conflict without end in the region. That is not in American interests and values like Kerry has stated. Since visiting Israel in the 1970s on a mission to help Israel’s environmental and other efforts I have had a strong affinity for Israel’s security and especially its democratic and humane values, but that set of values, like the one we are seeing soon in the White House and the GOP Congress, has been displaced by a far right regime devoted to what seems to the ultimate destruction of that democratic and dynamic nation and its security. What scares me more than anything is that Trump may only exacerbate globaly the move towards hate, conflict, and prejudice that already now exists and supports actions that are contrary to peace and democracy. We see that already in Trumps other “good friends” like Russia’s Vladimir Putin, Nigel Farage the right wing racist former leader of the UK Independent Party, and Marine Le Pen the leader of the neo-fascist National Front in France, and not least the barbarous murderous head of the Philippines Rodrigo Duterte. There is a point when we need to recognize the fragility of democracy and decency at home and abroad and come to its aid and stand united in its defense. Now, at the same time, we have to be clear about what is happening in the West Bank. The Israeli prime minister publicly supports a two-state solution, but his current coalition is the most right wing in Israeli history, with an agenda driven by the most extreme elements. The result is that policies of this government, which the prime minister himself just described as “more committed to settlements than any in Israel’s history,” are leading in the opposite direction. They’re leading towards one state. In fact, Israel has increasingly consolidated control over much of the West Bank for its own purposes, effectively reversing the transitions to greater Palestinian civil authority that were called for by the Oslo Accords. I don’t think most people in Israel, and certainly in the world, have any idea how broad and systematic the process has become. But the facts speak for themselves. The number of settlers in the roughly 130 Israeli settlements east of the 1967 lines has steadily grown. The settler population in the West Bank alone, not including East Jerusalem, has increased by nearly 270,000 since Oslo, including 100,000 just since 2009, when President Obama’s term began. There’s no point in pretending that these are just in large settlement blocks. Nearly 90,000 settlers are living east of the separation barrier that was created by Israel itself in the middle of what, by any reasonable definition, would be the future Palestinian state. And the population of these distant settlements has grown by 20,000 just since 2009. In fact, just recently the government approved a significant new settlement well east of the barrier, closer to Jordan than to Israel. What does that say to Palestinians in particular – but also to the United States and the world – about Israel’s intentions? Let’s be clear: Settlement expansion has nothing to do with Israel’s security. Many settlements actually increase the security burden on the Israeli Defense Forces. And leaders of the settler movement are motivated by ideological imperatives that entirely ignore legitimate Palestinian aspirations. WE WELCOME YOUR THOUGHTFUL COMMENTS! PART I : 2016 PROSPECTS FOR THE YEAR IN FOREIGN AFFAIRS AND NATIONAL SECURITY OR AROUND MUCH OF THE GLOBE IN HALF AN HOUR! PART I : 2016 PROSPECTS FOR THE YEAR IN FOREIGN AFFAIRS AND NATIONAL SECURITY OR AROUND PART OF THE GLOBE IN HALF AN HOUR! This post will take a quick look at some of the most important global challenges and issues Americans and the rest of humanity will face in this year. This will be a brief look at possible developments in key areas, what risks and dangers lie with the topic and what policies or actions might affect outcomes good or bad. Also indicate what America could, should, or should not do to address the dangers and problems inherent in each issue. In short a quick tour of the most difficult questions our present and likely our next president will likely face. There is no region more in disarray and conflict ridden than the Middle East and related regions. Nor is there a more difficult set of forces and issues which makes this region a complex quagmire and yet also more in need of conciliation, diplomacy and outside, yes outside help! Sadly the year 2016 started out with a worsening of relations between Iran and Saudi Arabia over a stupid if not malicious act of killing a Shia Saudi cleric which seems almost designed to escalate the conflict. It will certainly make putting together a necessary joint Shia-Sunni Iraqi regional governance model harder if not impossible. Yet it must be halted. The seat of most terrorism lies in this region and least we forget it impacts disastrously, more than anyone Muslims of all sects. We are trying to maintain a close dialogue with the key Shia government of Iran which is difficult at any time and with Saudi Arabia that wants unquestioned US support for its anti-Shia strategy. The latter position would be a disaster for America and our allies, in the end we need to be an “honest broker” and “peacemaker” not an outside protagonist. ISIS or the so-called Islamic State is now at the heart of violence in the Middle East. But there are also many groups and indeed governments who have given support to these brutal killing machines which we see in North Africa, Africa proper, and in Europe and America in individual attacks. 2016 is likely to see more of these and also more reaction by states to curb these terrorists. Under Obama’s cautious but directed and increasingly mixed-tools strategy, which curbs the deployment of large combat ground troops, and focus, as it should, on the Muslim states concerned taking the lead in routing out ISIS, seem to, at last, to make some progress. ISIS has lost some 30-40% of its population and/or territory in Syria and Iraq. We are likely to see “more of the same” but now modified to see what works best and least costly in terms of blood and resources and the key problem of “blowback” and “unintended consequences.” It was and is a wise policy which pleases nobody but is an fine example of “smart power” at work. No guarantee of working but the best option of all the other most bad ones. We are likely to see a tough debate in 2016 over a more militaristic approach verses a more cautious but evolving and multi-tools strategy using cooperation with others as a key component. This conundrum will not be solved in 2016 but the activities and attacks of 2016 will influence future outcomes. There are a number of Middle East countries which are in a critical state including Libya, Afghanistan, Yemen, Egypt, many African nations and others which need not just American attention but also from other key countries including Europe and Asian nations. In each case 2016 will require added major resources and attention via hard diplomacy and addressing some of the fundamental causes if each is not addressed the result will be the spread of conflict and terrorism. An example of a conflict that is getting worse not better largely due to the continued effort of Prime Minister Bebe Nethanhuh to make sure there will not be peace between Israel and the Palestinians. I can’t be less blunt about this. He has expanded illegal settlements in the West Bank and East Jerusalem which are all Palestinian lands. He has said outrageous words about Palestinians citizens in Israel and has said there will be no two state solution while he is in power. He has insulted and tried to undermined President Obama in as many ways as possible within the already fractured difficult American politics while getting un-presidented major military assistance from the same President to help Israel’s security. His recent visit to Washington to “make up” made little progress towards a peace deal. While the PLO has not been always helpful in the negotiations and remains weak and divided, and angery it was the continued settlements which forced them into desperate acts which is likely to bring the same sad scenario in 2016 unless there is considerable outside pressure to demand a need to solve this situation, which if not resolved is likely to inflame the entire region and threaten peace and produce a catastrophe for Israel itself. There are those who think America should give up on the Middle East. But the question is in 2016 can the West and other Middle East powers see the consequences of this path to mutual destruction and make an offer that can’t be turned down? Most experts are pessimistic, indeed opposed to any further efforts. They are wrong. If it is true that President Putin’s game is enhancing his and Russia’s strategic and geopolitical standing and he wants to be seen as a major international power, he will be seriously disappointed. If his game is to make “mock war” with the West, this path and this goal lies in failure and possibly mutual calamity. The keyis for the West to hold its unity and focus. Russia it is to be a responsible state looking to help peacemaking and constructively dealing with the many global challenges we face, Putin can win that game for Russia’s long term interests. His problem is really not just the low price of gas and oil, nor his military adventures, it is the tragedy that his policies have made of Russia. The Ukraine/Crimea gambit will prove to be costly on many dimensions and, if seen as it should, to be a cause of the downturn of the Russian economy and the standard of living of the average citizen (not you can be sure of Putin’s friends among the Oligarchy. Russia is increasingly, as I have written earlier, a “Potemkin Village” is an empty shell and darkness inside and despair growing. Putin is riding high in the opinion polls but much is also due to his harsh repression of any dissent as seen in his “contract killings” at home and abroad. The predictions are for recession, decline of the Ruble, continued low oil and gas prices and not least a continued from the top corrupt society which enfeebles a great nation. But this realization clearly has not yet happened among many Russians and may not in 2016. The test will be in Ukraine, Syria, and relations with the former countries of the former Soviet Union. A test will also be if he continues to carry out his provocative military flights and ship/sub/troop exercises near or over NATO nations. Given the recent past history, President Putin is not likely to let up on his dangerous indeed mad aggression and acts of war in Ukraine and Syria unless forced to do so from inside realities or outside pressure. He has backed time and time again brutal regimes and groups. His backing of Assad – a regime that has carried out now for years mass killings of its citizens in Syria. Assad’s is a terrorist regime itself. In an odd swing this action has put him on the same side as Iran and Hezbollah a terrorist group, an effort to be a likely costly goal of being a “big” player in the muddy Middle East. It is just the same game as his other aggressive gambits with nefarious “allies” in places like Georgia, etc. He may pay a cost and make enemies with the Sunni nations by his actions. He has from time to time tried to appear to seek common ground but with outcomes that only favor his prejudices and goals. He supports the Iran nuclear deal, and in theory a UN backed peace settlement and process in Syria. In 2016 we will see if this ends in peace and all will depend if he is willing to see in the near future Assad to go. His military chips are put down in the Syrian coast with added arms in 2016, but the forces at work are those he nor we can fully control. Look for a very hard road here in 2016 unless Putin changes his calculations. Look also for more allied bombing efforts against ISIS and possibly indirectly Assad’s forces if peace talks fail. And some work to deal with the refugee issues seems necessary. END OF PART I: COMING SECOND PART COVERS EUROPE, ASIA, NUCLEAR WEAPONS, GLOBAL WARMING, AND OTHER ISSUES. 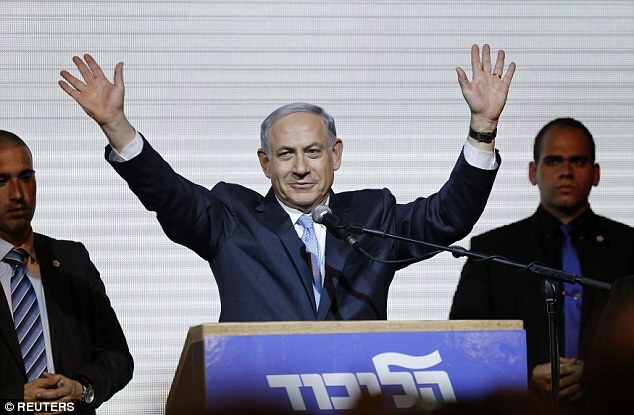 Israeli Prime Minister Benjamin Netanyahu’s ruling Likud Party scored a resounding victory in the country’s election. This month will bring together a number of critical events and actions which could determine whether we can see a clear path towards a measure of progress that can start the process of healing and mitigating the hate and carnage that we see today and lessen the chance of a total cataclysm. What is required is a high level of creativity, resources, and focus by all sides looking at their long-term interests. But frankly, recent events, not least the Israeli elections, do not bode well for lasting peace and building the mutual confidence and sense of common interest that must be the foundation of long-term security for all in the region and beyond. The first critical event is the elections in Israel. Clearly, given the outcome Israeli society remains divided between a constant “war” strategy and a long-term peace strategy. This time the “war hawks” won out but not by that much. This contradictory bitter split should be recognizable to Americans in our current corrosive political environment. The question is whether there can be, in this divisive environment, any growing consensus that develops into some kind of momentum towards returning to honest negotiations with the Palestinians to build a stable two state outcome that provides security for all sides. What then is the alternative? Incredibly, there was even post-election speculation that Bibi might go back to the two state solution, but after his victory based on anti-Palestinian policies and even promising thousands of more settlements, it is hard to envision at this moment. The question is when will the realities of the increasingly precarious situation of Israel set in and be the lever for a move towards a peace deal. The history of the reign of Netanyahu has been a series of acts, that in its totality, were against any reasonable settlement with the Palestinians. After mouthing from time to time the idea of a “two state” solution, he revealed just a day before the elections his true motivation all along, in trying to grab the West Bank and possibly displace people from their land or perhaps even confine them to unlivable, frankly, semi-concentration camps, looked over by their Israeli guards. The sad result of Bibi in his firm opposition to a two state solution, and saying there will be no Palestinian state under his rule, plus his attack after his election victory on the Arab citizens of Israel because, according to the NY Times, they had voted! His statement was even characterized by the New York Times editorial as a “racist rant.” Increasingly, there is a new authoritarian bent by Netanyahu and his Likud party; and a rigidity and myopic militancy that bodes badly for peace in the region and Israel’s own long-term security. There is a real danger that he will lead a democratic Israel down a path to self-destruction both externally and internally. What other option now can be possible other than a deliberate policy of impoverishment and degradation of the Islamic and Christian Arab West Bank population, and its own Arab citizens? He has already poisoned the key US-Israeli bi-partisan relationship as we have noted previously. The question that must be asked: what policy and direction should America and Europe take now that the very basis of any lasting peace agreement has been destroyed by Bibi’s actions? Having served in the White House I have no doubt that the lights there will be burning late to provide an answer. One key question is what should the U.S. do with its allies and other actors in the region to put back the building blocks of a lasting agreement that provide peace, security, and even a measure of prosperity for the people in the region. For the Israelis who are experiencing serious economic hardships including inflation that is robbing ordinary people of their livelihood and sense of self-worth; and who also desire a future free from conflict, they now face a very uncertain future, increased insecurity and new added risks. While coalition building still must take place and is currently unknown, a reassessment of American policy towards the Middle East and Israel is required. Already, there is a movement in Europe to recognize a Palestinian state. Bibi unfortunately leaves little scope for a constructive American role in seeking a settlement between Israel and the Palestinian Authority especially given the desire by Bibi to get America to preemptively attack Iran or contribute to new illegal settlements and to act as a supporter of dangerous actions that will only exacerbate the existing unrest and conflict in the region. Further, Bibi by playing a partisan and self-interested divisive role in American politics may have defeated any hope for the kind of constructive cooperative efforts by the U.S. to bring true peace to his people. Evolving events in the region may play the decisive role that may call for a basic reassessment of Israel’s security as noted by the statements of a group of senior security leaders who pointed to dangerous trends and poor policies by Bibi. The second event shaping the region is the beginning of serious “end state” negotiations on the Iran nuclear long-term “deal” that could put a stop on Iran getting a nuclear weapon at least for the next decade. If in the end a “good” deal is agreed with the proper verification elements, one of the truly disruptive (in the real meaning of this word, not the Silicon Valley robber baron meaning) elements fundamentally creating widespread conflict and insecurity might change the landscape of new nuclear danger to the region. It could also create an opening to larger political and military problem solving and deal with the upward trajectory of Shia-Sunni conflict. Already, Secretary John Kerry has been working to find a consensus among the Middle East states, both largely Shia and Sunni to form some common ground especially in light of the common threat of ISIS. This is frankly an effort against the odds. But there is a small opening now for a rethinking of old hatreds and a new assessment of existential risks of the ISIS ascendancy and the spread of terrorist extremism aimed at both traditional Sunni and Shia governments and people. In the end, this opening will have to be recognized by governments that too often have been dominated by prejudice and narrow interests. What might be needed is perhaps a new regional compact that creates a wider Middle East security structure that encompasses both Sunni and Shia nations and might include support and reinforcement by America and our European and Asian allies that have a large stake in stability and peace in the region. While Arab nations would naturally be a part of this, also non-Arab nations like Iran and Turkey should be part of such a regional compact of mutual security. It is clear that without some major political, economic, and military changes both in Israel and in the wider Middle East the trajectory towards chaos and destruction will overwhelm the fabric of cooperation and modest restraint and upheavals and civil strife will destroy the lives of all citizens and bring only perpetual war and killing as the norm. Our problem is that the acts by Bibi, the shortsighted viewpoints by some Middle East leaders, and our partisans in our Congress has undermined America’s role as the “indispensable nation.” They have deliberately sabotaged every key tool and effort to bring a measure of peace to our globe by President Obama and Secretary Kerry. There is a strong Republican desire to see Obama fail no matter what the cost in lives and security including that of Israel. More war and putting American troops at risk is their only option. Their new crazy right-wing budget and proposed heedless sanction and laws on Iran undermines the authority and the needed resources for a strong American capability to create a more stable, peaceful, secure and prosperous world. Without support at home by all of our parties, the chances of creating a more secure Middle East and beyond would be hindered. Disorder, humanitarian needs, and added wars will be the order of the day. 2014 A “RETHINKING NATIONAL SECURITY” YEAR: WHAT DOES IT PORTEND? 2014 A “RETHINKING NATIONAL SECURITY” YEAR:: WHAT DOES IT PORTEND? 2014 was without much doubt a significant year in terms of global security. One question is whether 2014 has set a trend in the makeup of our international order in the future and to what extent? The events of 2014 were at many levels transformative but also show much continuity with the recent past trends. Terrorism took on a new guise in the rise of the Islamic State (also known as ISIS, ISIL, Daesh, and “caliphate”), with the fierce occupation by this extraordinarily brutal group of large areas in both Iraq and Syria. The emergence of added conflicts and upheavals in the Middle East, Afghanistan, Iraq, Iran, and the Sunni-Shia divide were continuing factors of instability. But less mentioned is the serious question of unstable and nuclear armed Pakistan’s trajectory and that of nuclear India which is being reshaped still as this is written with unknown consequences. Another event of special note was the end of an assumed understanding about the security and inviolability of the boundaries and independence of existing European states by the invasion and occupation of Crimea and Eastern Ukraine by Russian troops and paid mercenaries. With the annexation of Crimea, and now continued fighting and uncertainty over the fate of Eastern Ukraine, the viability and security of the entire country has changed radically the landscape of Central and eastern Europe and beyond. NATO has reassessed its role and the implication of these actions resulted in agreement to establish a more robust “rapid reaction force.” America also has assigned a “rotating” troop and air armed units to the Baltic States. Putin has recently called NATO a threat to Russia and the new Russian strategic plan seems a bit more aggressive than earlier. Not least, with this external belligerence towards what Russian nationalists call “The Near Afar” or “Near Abroad” – their neighborly countries, – Putin has established increasingly harsh authoritarian rule over Russia and its people proper. This development is as important to global security and stability as is the Ukraine invasion and conflict. The two seem to be intertwined and have indeed been fed by Putin and his cronies heating up a new “fascistic” Russian xenophobia and militaristic nationalism. This effort can be attributed to the perceived need by Putin to shore up his domestic support in light of an increasingly economic catastrophe that Russia seems to be experiencing at the end of 2014; all due to Putin’s costly international blunders and foolish economic choices. Even Putin has acknowledged in his New Year’s message that Russia faces hard times ahead. The reality is the increased isolation of Putin personally and of Russia. Their economy ever fragile is now in real recession and week in many sectors. Global leaders realize, as do investors, that Russia under Putin is a risky place to place any bets on. This new realization by many is that Russia is in the hands of an incompetent, arbitrary, and illusionary leader who seems to care not a bit about the well being of his country’s people. Russia is weaker today than at the start of 2014 despite all of its aggression and seems destined to fall further under Putin’s harsh hand unless there is a major change of course. None of this is good news for the West, however, given the uncertainty of Russian behavior. On the contrary, America, led by President Obama and with the help of Secretary John Kerry and his team, is clearly in ascendancy, but largely unnoticed by our U.S. media or acknowledged by the Republicans. With the U.S. showing a recent 5% growth rate, better job numbers, and closer cooperation with Europe, it remains at the center of global decision-making and power. Further, with the negotiations with China over climate change successful, the continued push for Atlantic and Pacific free trade treaties, and the hope of successful nuclear talks with Iran continuing, there is some positive momentum for 2015. In addition, the successful efforts to help put together still fragile, but key new “unity” governments in Afghanistan and Iraq is better than the likelihood of immediate tribal conflict between major ethnic communities in the face of terrorist threats. One of the great new creative developments has been President Barack Obama’s initiative to reestablish relations with Cuba. This is a landmark action with potential to change the entire playing field regarding a nation that is in a time of major transition. Obama has with one stroke of the pen re-engaged America with Cuba. He recovered two prisoners and let long serving Cubans in jail free, see political prisoners released, broadened the areas of exchange of visits, goods, and dialogue, advancing towards early establishment of full diplomatic relations. Yet, what one must also recognize is the continuing monumental challenge that faces all of mankind and our natural world: climate change. And 2014, while it did not bring about any immediate significant global move to fully address this existential threat, has nevertheless shown some progress and hints of what the major powers might be trying to move towards to mitigate, if not yet fully solve the coming cataclysm. This has largely been done by executive authority whether by domestic pollution regulation or by international diplomacy. Also among the non-events, Iraq and Afghanistan did not yet disintegrate into warning ethnic and political conflict but at least for now choose a path of political compromise and efforts at inclusiveness, thanks to the intensive efforts of Secretary Kerry backed by President Obama along with efforts of other diplomats. China did not make a full war yet over the South China Sea islands, and Putin did not yet attack any NATO countries, although he did send irresponsible flights and ships near NATO counties and neutrals to show his great detest toward their sanctions. North Korea did not use its nuclear bombs and thus saved itself from total destruction. And American politics continued, without change, its corrosive politics, however adding one electoral change that may have extended the power of its crazies over the Senate. What did not happen in 2014 is almost as important as the events that did. We did not attack Iran, nor do we have combat troops in Syria yet. We have not changed our goal to pull direct combat troops out of Afghanistan, but did act to support that frail nation and its armed forces in more constructive ways. Russia did not become “Nine Feet” tall but simply diminished itself with its own acts of silliness and cruelty. Additionally, Scotland did not become an isolated mini-state north of Britain, the American economy did not “tank” but grew and in the 3rd quarter some 5% annual growth. Lastly, Europe still did not really recover from it own self induced “austerity” policy which has proved a disaster for most of the EU counties that tried that disastrous road. Sadly, the Middle East remains in deadlock; largely by the determined and also self-destructive efforts, not least new settlements, of the current Israeli government to destroy it seems the only possible rational creation of a two state solution. Nor did the PLA do much that was constructive. Gaza was a tragedy for all sides. In the coming weeks we will be writing about what 2015 and beyond may bring, and look at how America might shape events towards positive outcomes and perhaps even more real security and peace. Most of President Obama’s State of the Union speech was focused on domestic issues, especially the need for America to move forward in dealing with glaring inequality and the need for good paying jobs, but not least improving education and investment in science and technology in our decaying infrastructure. These are, in fact, intertwined with America’s leadership capabilities in an increasingly high risk and complex world. He called last night for a more robust diplomacy and an end to “endless wars” that sap the strength of America and its larger purpose in our world. 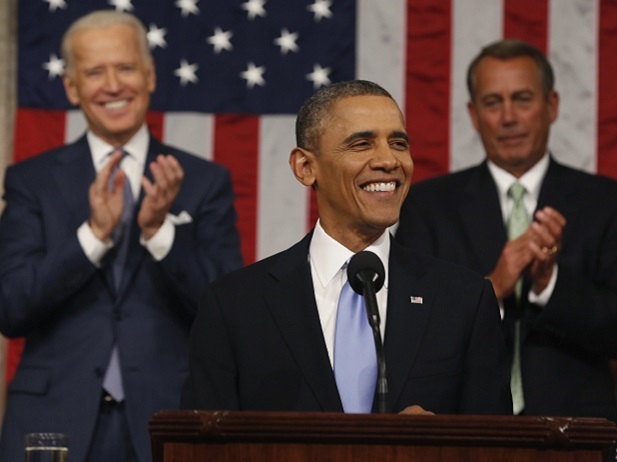 The speech was both idealistic and realistic, a trait that characterizes much of President Obama’s stance on dealing with many challenges he has had to face. Given the bitter opposition by the right wing Republicans throughout his tenure, he focused in large part on what could be accomplished at home and abroad on his own. Not to the exclusion of finding some common ground on some issues, but clearly he has been chastened by single-minded and merciless obstruction. Let’s look at that list and how Obama addressed the international issues to the American people, as that was his main audience since some half of the Congressional audience was in a dead brain coma. Just look at Speaker John Boehner during the speech, and you will know that syndrome. On the other difficult negotiation, namely sanctions dealing with Iran’s nuclear ambitions, as Obama stated, America has made real progress, and he made clear that new legislation that has been proposed by a group of anti-Obama Republicans and some Neo-Con war hawks will get his veto if passed before the conclusion of the present talks dealing with the long-term issues. “And it is American diplomacy, backed by pressure, that has halted the progress of Iran’s nuclear program – and rolled parts of that program back – for the very first time in a decade. As we gather here tonight, Iran has begun to eliminate its stockpile of higher levels of enriched uranium. It is not installing advanced centrifuges. Unprecedented inspections help the world verify, every day, that Iran is not building a bomb. And with our allies and partners, we’re engaged in negotiations to see if we can peacefully achieve a goal we all share: preventing Iran from obtaining a nuclear weapon. “But these negotiations do not rely on trust; any long-term deal we agree to must be based on verifiable action that convinces us and the international community that Iran is not building a nuclear bomb. If John F. Kennedy and Ronald Reagan could negotiate with the Soviet Union, then surely a strong and confident America can negotiate with less powerful adversaries today. “The sanctions that we put in place helped make this opportunity possible. But let me be clear: if this Congress sends me a new sanctions bill now that threatens to derail these talks, I will veto it. For the sake of our national security, we must give diplomacy a chance to succeed. If Iran’s leaders do not seize this opportunity, then I will be the first to call for more sanctions, and stand ready to exercise all options to make sure Iran does not build a nuclear weapon. But if Iran’s leaders do seize the chance, then Iran could take an important step to rejoin the community of nations, and we will have resolved one of the leading security challenges of our time without the risks of war. It is the almost impossible challenge of trying to get the warring factions of Syria and their external backers to bring a measure of security and peace to this major civil war that threatens a major regional inter-communal conflict. The problem of Syria was touched on, and this may be his weakest component in the international section. Apart from support for the existing diplomacy, he only briefly mentioned support of the moderate opposition forces, but did not set out any larger vision or new ideas of how to put an end of this horrific killing fields. He said, “In Syria, we’ll support the opposition that rejects the agenda of terrorist networks… American diplomacy, backed by the threat of force, is why Syria’s chemical weapons are being eliminated, and we will continue to work with the international community to usher in the future the Syrian people deserve – a future free of dictatorship, terror and fear.” Perhaps the statement was short because hard new decisions remain under debate in the administration and awaits the final outcome of Geneva II. It could also be the almost impossible challenge of trying to get the warring factions of Syria and their external backers to bring a measure of security and peace to this major civil war that threatens a serious regional inter-communal conflict. What was also left out was addressing our challenges in Asia, especially the China-Japan clash, the rise of China, dealing with Putin’s Russia, North Korean nuclear efforts, and a fully defined vision on how to deal with climate change, global health needs, poverty and inequality, and strengthening international institutions. However, the speech, for good reasons, mainly addressed domestic policies. One can hope before too long Obama will set forth his fuller vision for all the other international issues that need America’s attention. Obama clearly sees as his lasting legacy the ending of not only the headless Iraq war, but also finally, the active fighting by Americans and the allied forces in Afghanistan. He has seen the price of these wars to Americans and the blood and resources they cost. On his watch, America will see the end of large scale warfare in a distant land which sadly had little understanding of consequences and mission. But the larger message of this speech was Obama’s diplomatic and international ambition of a new vision for America and the world that does not heed the erroneous militaristic and stupid turn our nation took with the start of the Bush II administration. He outlined his hope for an America that will again be a constructive and thoughtful world leader using all the tools of “soft power,” while holding the use of military force only when absolutely necessary and when objectives and risks are clear. REAL PROGRESS ON IRAN NUCLEAR ISSUES: WHY IT IS LIKELY A FINAL SUCCESS! The announcement of an interim agreement with Iran over its nuclear program is significant and has drawn both critics and supporters. Yet in all the analysis few have drawn the truly long-term implications and just how this stage is key to long-term success. The parameters of this deal all point towards a possible successful outcome after what will be very hard negotiations and many trade-offs. What is clear is that the Iranian government and key leaders would not have gone down this path and agreed to serious restrictions on their enrichment and daily verification if they did not want and were willing to make a long term deal also. Any good diplomat or negotiator needs to see the perspective and interests and fears on the other side. President Obam and Secretary Kerry were right when they said about both Syria and Iran that they would not have come to the negotiating table unless it was a better option to the likely outcome of the status quo and its consequences. In the case of Iran, getting to the “bomb” would result in possible, even likely, catastrophic outcomes and certainly a strengthening of the sanctions which already have cost the Iranian economy greatly and were likely to do even greater harm. The new Iranian President clearly had a mandate from the “Supreme Leader” for a deal which inevitably and manifestly had to lead to serious restrictions on their ability to enrich to bomb grade uranium and move to a full nuclear strategic capability. It would do no good to go down this road with the Western negotiators knowing the effort would collapse and with it their economy and invite kinetic responses. On the other hand a total capitulation to Western demands would have set off a revolt by the hard liners in Iran’s military and conservative groups which was likely equally to be unacceptable. Thus, the long-term outcome likely will be an acceptable compromise which permits strong international inspection and oversight rather than a total dismantlement of the entire nuclear efforts. Clearly there would be strict and key restrictions and intrusive inspections, making it near impossible to move towards a weapon. Looking down the road, some also think it might open up a wider set of talks on broad regional issues which would bring a measure of stability to the region and might, just might, lessen the Sunni- Shiite conflict and enlist Iran towards stopping their support for terrorists and cooperation on Iraq and Afghanistan. Something would also have to be done to assure the Gulf States that their own security would not be threatened by any deal but would indeed enhance their security. All of this is still a hope and the road is hard and long to get to all of this and events not controlled by any of the actors in this drama. On the road to a deal also is the stance of those who are opposed almost to any deal. What is most disturbing is the cry from Israeli Prime Minister Netanyahu, who has it seems, opposed any realistic agreement between the P5 + 1 group and Iran. Indeed, there is a now more lively debate in Israel over the choices that the hard line government has made. Many in Israel and beyond question the wisdom of a unilateral military action by Israel or the long-term implication of opposing efforts for finding both peace and security through diplomacy, and a stance threatening the close relationship of common interests and shared values between Israel and America. The other threat is here in the United states, as noted in the recent New York Times editorial “Getting to Yes With Iran,” by those who seem bent on any agreement by President Obama on Iran, and I would add a balanced Israeli-Palestinian peace accord. Here the leaders in Congress and in particular the Senate Democrats need to stand firm with the President on not applying now new sanctions. There will be plenty of time to do so if either the interim agreement breaks down or there is no follow-through. That there is a concerted effort to sabotage the president’s effort by Republicans and even some Democrats, to find reasonable and possible solutions to both the Iran issues and the efforts at the Middle East peace is frankly appalling and morally reprehensible. Let’s see what can be accomplished and during Thanksgiving give thanks for the hard efforts of Obama and Kerry, rather than throw stone at the peacemakers.